Nowadays with the development of our smartphones there are many apps that are being created daily, becoming more and more helpful tools, offering us to make our daily tasks easier to do. One of the best examples are the tracking apps that allow us to keep track of our tasks and activities daily. Even when it comes to telling lies, there is a tracking app to help you track the lies you tell people around you. So, we looked and we have the right app for you – Track Your Lie. What is Track Your Lie all about? The Track Your Lie is one efficient and highly helpful lifestyle app that is developed for android users. 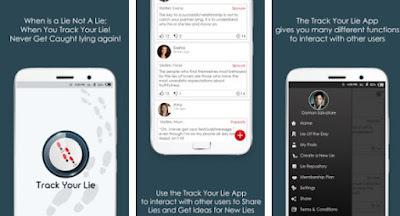 This app is a tracking tool, helping its users to keep track of lies they are telling people around them as friends, bosses, families or significant others. Offering the users avoid getting trapped in their lies, making lying to people easily done. The users just need to create a lie and choose the person they want to lie. The users are offered complete privacy of the lies. With the help of this tracker, the users are sure they won't be caught lying. Easy to use and highly practical tool, this app offers purchasing a premium membership or daily signing in the app for collecting virtual coins and use them for upgrading the app's features. The app's menu offers the users to simply create a new lie with choosing the person they want to lie to from their contact list as the category for the lie they plan to tell. Highly private and secure, the users can be sure that their lies, are protected in the Lie Bank. On the app, users can be a part of the ''Lie of the Day'' contest, publishing their lies and competing with other users. Offering interactions among users, the app allows sharing or getting ideas for lies. Also, users are allowed to like, share or comment on shared lies. This app gives details about user's lies, with specific dates when the lies were told. Users can lie to 3 people for free and up to 10 people for $1.99 or an unlimited number of people for $2.99. Download this app on Google Play now.